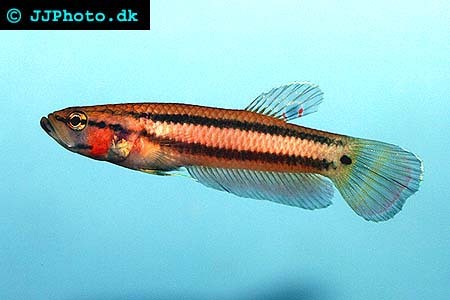 Company: Betta macrostoma (Peacock Mouthbrooder) can be kept with other not to aggressive species. Aquarium setup: Betta macrostoma (Peacock Mouthbrooder) needs a large aquarium with plenty of space to swim in. The aquarium should be decorated with a lot of plants creating hiding places for weaker fishe. Betta macrostoma (Peacock Mouthbrooder) a well covered aquarium because this fish likes to jump. The minimum length of the aquarium should be 100 cm / 40 inches. Betta macrostoma (Peacock Mouthbrooder) males are aggressive with each other. Females are very peaceful. Feeding: Omnivorous. Prefers live and frozen food.